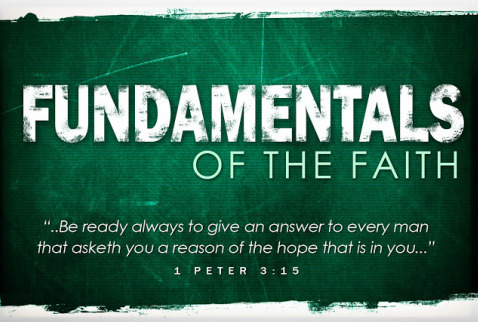 HOWEVER, that being said, it is possible for someone to agree to the truth of these fundamentals and NOT be saved! The Bible speaks of “believing in vain” (1 COR 15:2) that is – not expressing true faith in Christ to the saving of the soul, that brings evidence of a changed life: a new found love and yearning for GOD, His Word and a desire for a life of holiness, a desire to share Christ with others, a hatred for sin, evil and Satan, the great enemy that we wage war against. 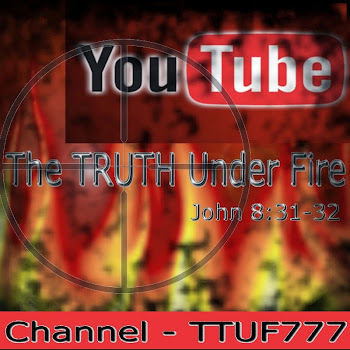 Ø The First Fundamental: the truth as recorded in Holy Scripture. The Bible, from the Latin word ‘biblos’ means ‘book’. We believe that this is a book like no other – among the myriads of innumerable books that fill hundreds of thousands of libraries the world over, this one book is unique, not because it claims to be a word from God – because many religious books make that claim, and the Bible does too. The difference is, that the Bible incontestably proves that it is the very Word of God (but that’s for another study. . .). We believe that the WORD of GOD is sufficient to fully equip us with everything we need spiritually, mentally, emotionally for this life: it provides for us doctrine – that which is true and right; it provides reproof – to show us what is not right; also correction – how to get it right and instruction – how to stay right in heart, word and deed. The Word equips us completely for all good works that GOD has already planned out for us in our lives (EPH 2:10). We believe that a literal, grammatical, historical interpretation of GOD’s Word is the only interpretation; this is not a book of allegory, mere story or myth; this is a book of propositional (belief is validated by truth), inerrant, infallible truth – that is, a book of definite statements, clear and understandable that represents the truth of GOD, expressed in language that we can comprehend. Ø The Second Fundamental: the sinful nature of humanity and the resulting curse of sin upon creation (ROM 8:21-23). The Bible plainly declares that mankind exists, from the time of the fall of Adam in the Garden of Eden, in a sinful state, wholly depraved, unholy, unrighteous, entirely separated from and rejected by our Holy GOD – unable to understand Him, much less have any fellowship with Him. 6 But we are all as an unclean thing, and all our righteousnessES are as filthy rags; and we all do fade as a leaf; and our iniquities, like the wind, have taken us away. 7 And there is none that calleth upon thy name, that stirreth up himself to take hold of thee: for thou hast hid thy face from us, and hast consumed us, because of our iniquities. Man’s heart is “deceitful and desperately [incurably] wicked” (JER 17:9). You mean that not even GOD can cure the wicked heart of man? No, GOD cannot – but He can replace the old heart with a new one! That’s what being born again is all about (EZEK 36:26; JOHN 3:3-5; 1 PET 1:23; TITUS 3:5). GOT QUESTIONS, the following quote from: Total Depravity – Is It Biblical? Examine your heart and life in the light of the Ten Commandments truthfully, and you will realize you are hopeless to do anything to save yourself. You must look to another to save you. If we truly understand the evil, rebellious nature of mankind, and then come to understand the absolute purity and holiness and righteousness and goodness of GOD – we will at that point grasp the reality that any possibility of people being accepted by GOD by their own ‘good deeds’, or religious practices is entirely hopeless (Reading ROMANS ch. 1-3 will ably demonstrate this truth!). 15 But as he which hath called you is holy, so be ye holy in all manner of conversation [life]; 16 Because it is written, Be ye holy; for I am holy. 1 Great is the Lord, and greatly to be praised in the city of our God, in the mountain [not a mound, not a knoll, not a big hill] of his holiness. 2 Beautiful for situation, the joy of the whole earth, is mount Zion, on the sides of the north, the city of the great King. 14 Thus saith the Lord, your redeemer, the Holy One of Israel . . . 15 I am the Lord, your Holy One, the creator of Israel, your King. It is because of GOD’s absolute and pure holiness, that He must judge, condemn and punish sin, from the smallest one ever committed, to the greatest sin. GOD is entirely holy, separate from His fallen creation, set apart from any living creature that has the sin nature – so that His Presence cannot dwell where sin reigns. We have no idea what the depths and heights and great expanse of GOD’s holiness is about – we are strangers to such a nature, and it’s only by being in Christ that we begin to taste now in this life, what will be a sumptuous banquet in the glories of heaven! The famous Greek philosopher Socrates once said, “It may be possible for Deity to forgive sin, but I don’t see how.” For a pagan intellectual, that is some significant insight! He realized the concept of the absolute holiness of Deity, that He could not tolerate evil and inevitably would judge all such evil. Yet he also recognized that Deity is absolute goodness, with compassion and mercy. His holiness demands justice upon sinful man, whereas His love desires grace for fallen souls. How could these two primary characteristics of GOD: His holiness, and His love, come to a meeting point where both could be satisfied? As we here know, that meeting point occurred 2,000 years ago, on a lonely, bloody hill outside of Jerusalem, called Calvary and Golgotha. It was there that the Eternal Son of GOD took upon Himself the eternal judgment of GOD the Father, and the eternal punishment for the sin that we have all committed against the Eternal Law of GOD! In exchange – the perfect and pure holiness of the SON, the ONLY Person that the Father could look upon with Holy Eyes and see absolute, flawless perfection and He could legally, and righteously declare sinners not only ‘not guilty’ of sin, but also cloth them in the perfect robes of righteousness of His Son, Jesus Christ. This is available to any and all, who will place their faith in Christ, and trust His work of salvation that He alone accomplished on our behalf, with the motivation of love for us, as well as bringing glory to the Father for the Supreme gift that is His Son! The Cross of Christ is indeed a bridge that brings the Holy GOD and hopeless sinners together and makes provision for our salvation! NO OTHER RELIGION can offer this! NO OTHER RELIGION has such a provision for salvation. NO OTHER RELIGION other than Christianity offers salvation by grace – in EVERY religion, one must earn one’s way to salvation, by their own religious works – but on the day of Judgment, EVERYONE outside of Christ will be judged, not by the laws and rules of their own religion, but by the Holy Law of GOD! The nature of our salvation in Christ – is it eternal or temporary? While there are those who subscribe to either of these two beliefs – those who believe their salvation is eternal, based exclusively on Christ, while others believe salvation is dependent on remaining faithful to Christ – the issue is that salvation is in Christ and Christ alone. If we are truly saved, born again of GOD’s Spirit, then we are sealed by the Holy Spirit unto the day of redemption (EPH 4:30; speaks of this, the day when Christ redeems our natural bodies with its sin nature and takes us from this world, granting us glorified, incorruptible bodies with no sin nature at all (ROM 8:23) – and we go Home to heaven) and secure in our salvation. For me, the question of greatest importance is not – Can you lose your salvation? But rather, Are you sure you are genuinely saved to begin with (2 COR 13:5 “Examine yourselves whether you are in the faith…”)? We read this already, but let’s hear it again! Check out ISAIAH 53 and you will read as eloquent and profound a description of salvation as can be found anywhere in Scripture! Every religion and cult will either take something away from the Person of Christ, or try to add something to Him. The Jehovah’s Witnesses try to take away His Deity and call Him “Michael the arch-angel”. Islam also takes away His Deity and calls Him “the greatest prophet, second to Mohammad”. The Roman Catholic church tries to add works to the cross, as something necessary for salvation. Other legalistic Christian churches will likewise add works necessary for salvation or add water baptism as a requirement for salvation. The Hebrew Roots Movement tries to add obedience to the Mosaic Law to salvation in Christ. This doctrine, the Deity of Christ, is closely associated with our redemption as declared in the Gospel, as well as with the Trinity (which we will discuss next). The whole point in the Father sending His Son to this fallen world is that He needed a representative to show the world what GOD is really like – who but GOD could truly represent GOD? A saint couldn’t do this, not perfectly, nor could any prophet – nor could an angel or arch-angel or a cherub. Only GOD could do this, and so the Spirit of the LORD came upon Mary and she conceived her first-born, who was not fathered by any sinful man, but by the Holy GOD of creation. Because Jesus is the ONLY Begotten of the Father, He has the same nature of the Father – sinless perfection and holiness. For this reason the virgin birth is part and parcel of the fundamental truth of the DEITY and Humanity of Christ. The LAMB of GOD Who takes away the sins of the world (JOHN 1:29) had to Himself be sinless - otherwise He could not be an appropriate propitiatory sacrifice. In the beginning was the Word, and the Word was with God, and the Word was God. 2 The same was in the beginning with God. 14 And the Word was made flesh, and dwelt among us, (and we beheld his glory, the glory as of the only begotten of the Father,) full of grace and truth. But unto the Son he saith, Thy throne, O God, is forever. (a quote taken from PS. 45; if you read the entire Psalm you will see that GOD is saying this to another, that is One Who is also GOD, GOD the Son). The LORD Jesus Christ is 100% fully GOD and fully man – He is not 50% GOD and 50% man, or 100% GOD at one point and 100% man at another point. He is ever and always completely GOD and entirely man – this is the hypostatic union – how can Jesus be completely both? It’s a mystery that the Scriptures speak of, that we at this point cannot fully understand, but when we see Him, we shall know all things (1 COR 13:12). The Deity of Christ is connected with the truth of the Triune or “Tri-unity” of GOD – Three Persons, individual in their own right, but comprising a unity that is so unified as to be One. How can three be considered one? Remember what Scripture says about Adam and Eve? MARK 10:8 says that these two people are no more two, but “one flesh” that is, even though Adam and Eve were separate individuals, they comprised a single ‘unit’. Likewise, the division that was between the Jewish and the Gentile people for millennia has been taken away in the Person of Christ: no longer are New Testament saints considered Jew or Gentile, but a new man in the body of Christ (EPH 2:15). Considering the Hebrew words used to express the idea of “one” there are two different words that can be used: yachid, which means the numerical one or echad which means a unit of one. If you’re watching a football game on television, you see many players on the field, but how many teams are there? Just two. Take away one of those teams, you still have many players, but how many teams? One team – they comprise a single ‘unit’ of players. Dwelling in Eternity there are Three Players: the Father, the Son and the Holy Spirit which represents “team GOD”. Hear, O Israel: The Lord our God is one Lord: the Hebrew word used for the word “one” is not yachid, but echad – a unit of One. The very word for ‘GOD’, first seen in the book of GENESIS is Eloheim, which is the plural form for El, expressing the plurality, not singularity, of GOD. All Three Persons of the Trinity are equal in holiness, power, character, knowledge – identical in every way except in the roles that they have: There is the Father, Who oversees all; the Son who is subservient to the Father and the Holy Spirit Who moves in the direction that the Father and Son instructs. All Three members were active in the creation, in the resurrection of the body of Jesus, in the indwelling and empowerment of the believing saint, in the revelation of truth. If GOD was only One Person, and Jesus Himself was GOD alone - then tell me, when He hung on the Cross as our sin-bearer, Who could judge and condemn Him as He bore our sin? Whoever would judge the Lamb of GOD when He died in our place for our sins, would have to be absolutely righteous, and absolute Deity - Jesus couldn't be the Judge against our sin, since it was He Who was bearing our sin. There had to be another, and indeed we know that it was the Father that judged the sin that He placed upon His Son (ROM 8:3). And so, these are fundamental, objective, prepositional truths of GOD that can no more be changed or altered than GOD Himself can be changed or altered (JAMES 1:17; HEB 13:8). 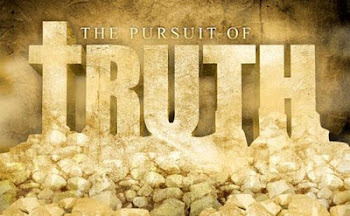 As much as this world hates the Light of GOD’s truth (JOHN 3:20) and they would insist that truth is subjective and relative, not objective and absolute – all such protest and objections are vain, futile and does absolutely nothing to change GOD or His truth. We cannot compromise these fundamentals, we cannot ‘dialogue’ with people of other beliefs and come to a consensus where we agree on the middle ground. We must be resolute where GOD says to stand and be willing to yield where GOD permits us to yield. Again, we cannot negotiate these fundamental truths with others who don’t believe as we do; we cannot and will not compromise the precious truths of GOD’s Word with the world that hates the light of GOD’s Truth or with a lukewarm church that is slowly growing cold in the environment of an Emergent Church-style Mother of Harlots. We will stand firmly, solidly, unflinchingly, unapologetically on the fundamentals of GOD’s Word no matter how much the world may hate and persecute us for it. We would rather stand with GOD and be loyal to Him and suffer for it, than to be called a welcome friend of this world and be considered an enemy of GOD!